If you want to have a successful yard sale, one of the most important things you can do is to get more people to simply notice your yard sale. The more people who a) See your sale, then b) Choose to slow down when driving by your sale, and finally c) Actually get out of the car to have a look around your sale… the higher your profits will be. Hang flags, banners, balloons, and signs — anything that will move around in the breeze and catch someone’s attention. Peripheral vision is a great thing… especially when people are driving by without having any intention of stopping at a garage sale! So the more you can call attention to your yard sale the better. Period. 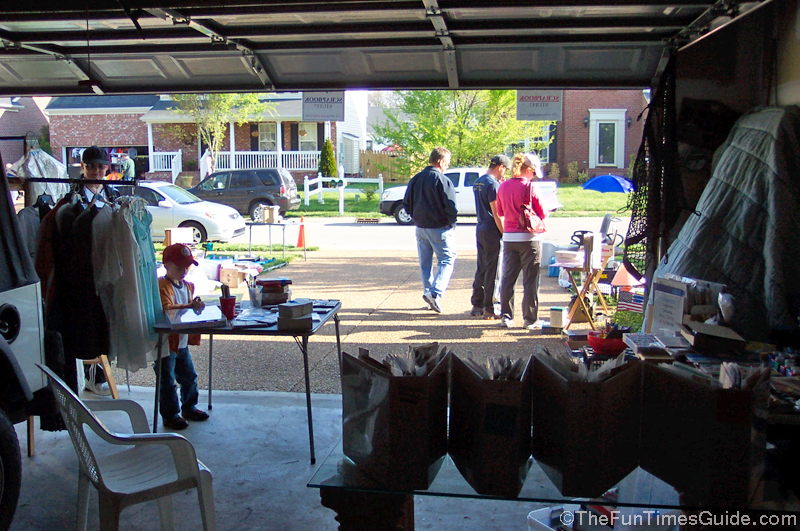 This is even more important if most of the items you’re selling are in the garage — hidden from view. You want to do everything you can to lure people to your sale. Not to mention the fact that crowds of people attract even more people. So you always want to have a crowd (large or small) looking at the items in your yard sale. If someone drives by and sees no one looking at your stuff, then it gives them the impression that you probably haven’t got anything good left. We always hang “party flags” — pennant shaped plastic flags that dangle from one long plastic ribbon. These come in all shapes, sizes, and colors. Your best bet: Just pick up whatever is on clearance at the local party supply store! Because the fact of the matter is, the logo/design/saying on the party flags doesn’t matter one bit. No one even notices what’s on them… simply that they’re there attracting attention! Through the years, we’ve acquired some old Kodak film party flags, as well as some race car checkered flag ones. It’s also a good idea to place balloons and/or streamers on your mailbox. And don’t forget to call attention to your items by hanging lots of small signs above the items themselves! Some interesting facts about Jumping Beans, including how Jumping Beans work. The more colorful or oddly shaped your attention-getting items are, the better. Neon orange — like hunters use — works wonders. As do neon green and bright yellow. 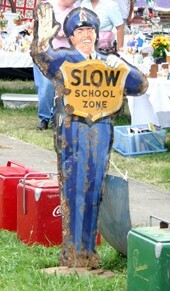 Even something that’s brightly colored but seems to have no place at a yard sale will work. For example, I also have a bright orange parking attendant vest. Sometimes I simply drape that vest over our mailbox whenever I’m having a yard sale. If you have any other odd-shaped or unusual items lying around your house, put them to work for you out at the curb on the morning of your yard sale. Life-size cutouts of people (famous or not, it doesn’t really matter). Better yet: tie a balloon onto the wrist, or put a floppy) hat on the person’s head. Remember, you’re trying to draw some attention! Bright orange or neon green colored posterboard signs. Don’t “junk it up” with a lot of handwritten words. Simply “STOP HERE!” or “FREE STUFF!” will work wonders. e item itself — which may even start some competitive bidding! Think outside the box, and utilize something you have that others would love to see, or try, or learn more about. 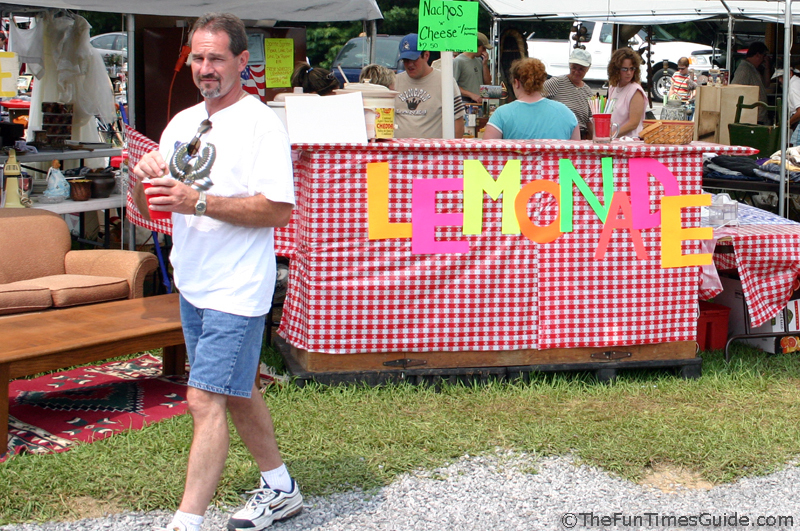 Maybe… have your snow-cone machine working & sell snowcones for 50-cents each during your sale. Or a lemonade stand staffed by yourself, your children, or a few neighborhood kids. Or, make a big sign that shows items that are FREE for the taking. I do this at each of my yard sales.